Son of murdered man wonders why it took 3 years for Defense Ministry to admit murder was a terror attack. 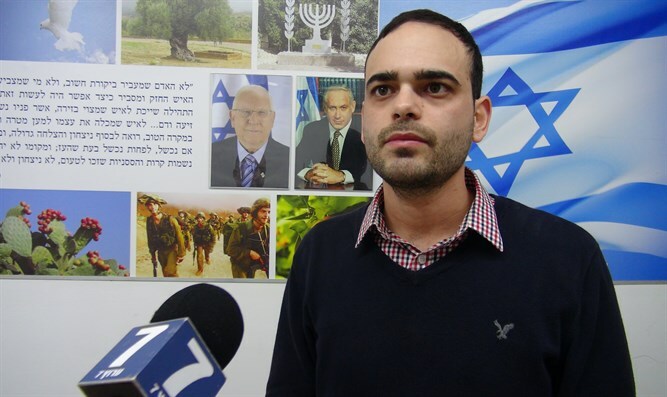 Elia Bar Kapara, the son of David Bar Kapara, who was murdered three and a half years ago, praised the Defense Ministry's decision to recognize his father as a terrorist victim after a long and arduous struggle. "The decision of the Defense Ministry was received with great joy but with great sadness," he told Arutz Sheva, noting that he did not expect the state to object to recognize the murder as a terrorist attack. "We received support from the public and we asked very difficult questions of the police and Shin Bet, and we did not receive an answer. To date, some of the questions remain unanswered." "Three and a half years ago, two terrorists spent a whole night in my father's vineyard," he said. While his father was learning in the vineyard "they attacked him from behind with rocks and stones and did not stop until he was thrown to the ground. The police claimed that this was a robbery, but nothing had been stolen and this is a terrorist incident, The blows that Dad suffered after he was already subdued to prove that the terrorists came to kill a Jew who was studying Torah in the vineyard. " "For the last three years, we have been fighting the terrorists to get them into prison for as many years as possible. One of them was sentenced to life imprisonment and the other, unfortunately, only received 18 years in prison. "The struggle with the Defense Ministry was long. The Ministry continued to claim the murder was committed during a robbery. The difficult and unanswered questions reached one conclusion that this was a terror incident, and that is what caused the Defense Ministry to be convinced, unfortunately, only after three and a half years. "The struggles hit us hard - both in our private mourning for our father and in his commemoration - only today are we free to pick up the pieces and engage in commemoration. "The struggle is not over. We expect the homes of terrorists to be destroyed and to receive recognition like any other family. One of the most difficult things I remember is the first memorial day that no one called and we were not invited to any ceremony for terror victims. This day is mixed with great sadness, and I very much hope that after the struggle we will focus on commemorating my father,"